On a lazy Wednesday evening we, the romantic duo just dropped in for a dinner at this European-African theme restaurant that’s been creating a buzz ever since it opened late last year. An association of Guy Clarke, a masterchef South Africa finalist and Rishim Sachdeva who has got a resume that flaunts about working with Mattias Taubert and Heston Blumenthal, was enough to create a gourmet stir in the Capital. 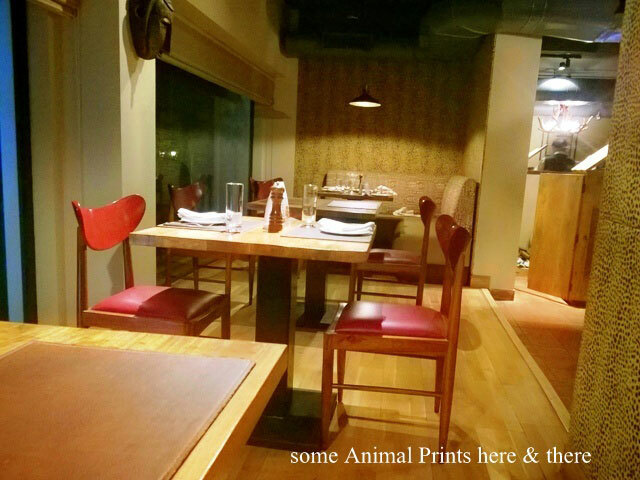 And yet almost after a year we took the lift to reach this restaurant spread on 2nd and 3rd Floor in the upmarket G.K 2 locale. 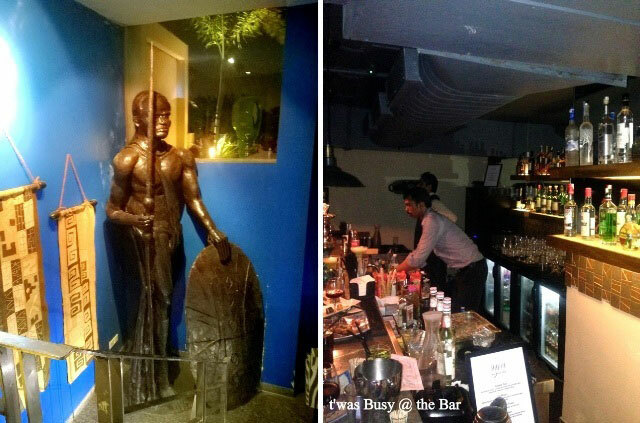 The interiors resonate with the African theme; a gigantic African tribal statue welcomes you into its contemporary dining area on the lower floor. The interiors have a hint of African wildness in the way a few sofas are lined in Zebra print, while the general ambiance however thankfully is contemporary and sophisticated. 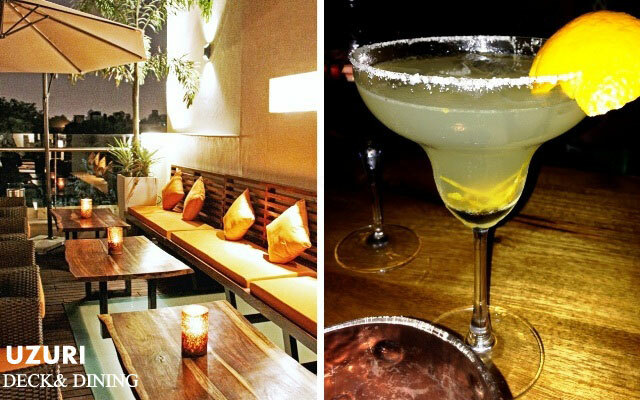 The top or the third floor seemed livelier with the open bar and open air deck, perfect on the overcast evening. So we comfortably found ourselves a table on the deck and I did observe that the bar was quite crowded for weekday night, and that’s should be a good thing isn’t it. Yet, to our dismay we later realised that there was a private party on at that floor and the crowd started encroaching into the privacy of other visitors forcing us to move downstairs after the first course. The service was as poor as it can get, fist we were readily admitted to the deck and then were left on almost on our own through the evening. No one to take orders, we were not offered a single glass of water throughout the evening; the drinks arrived after a second reminder. The waiters were perhaps too busy collecting their tips from the tipsy hedonist party crowd, for we had to call out every time. A mood that was quite let down by the service standards found a little solace when our glasses of the cocktails arrived. The respective Margherita and Sangria were both a perfect blend, so I decided to ignore the service and concentrate on the menu which seemed to be delectably crafted. We started off with a Salmon Fish Cakes and Jerk Chicken. 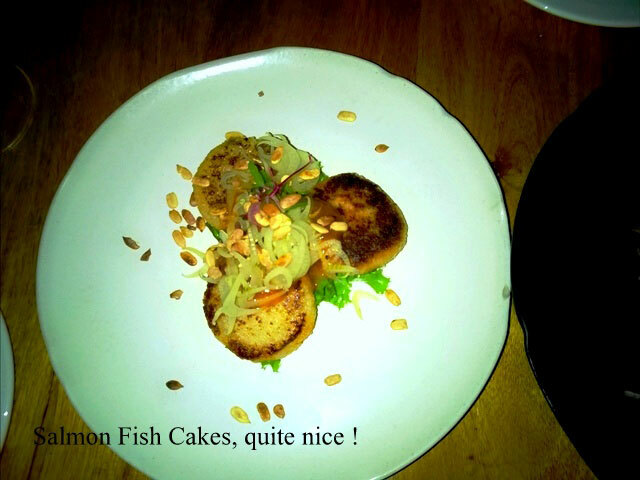 The Salmon fish cakes definitely stood ahead with its distinctly spicy and fragrant soft texture. 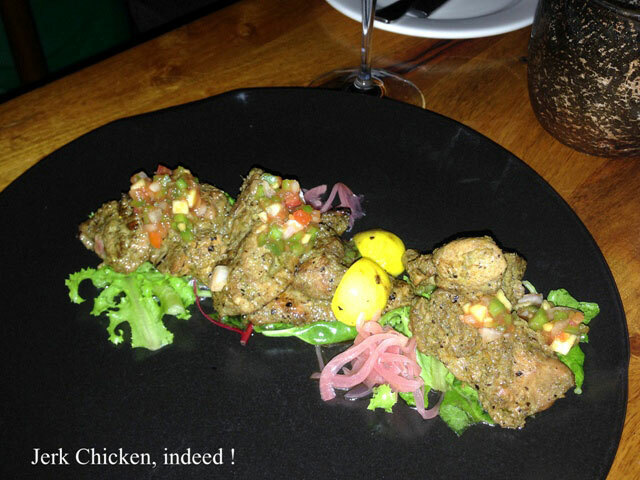 The Jerk Chicken was good if not great, one is reminded of our Goan Chicken Cafreal while biting into the chunks of well cooked chicken though. 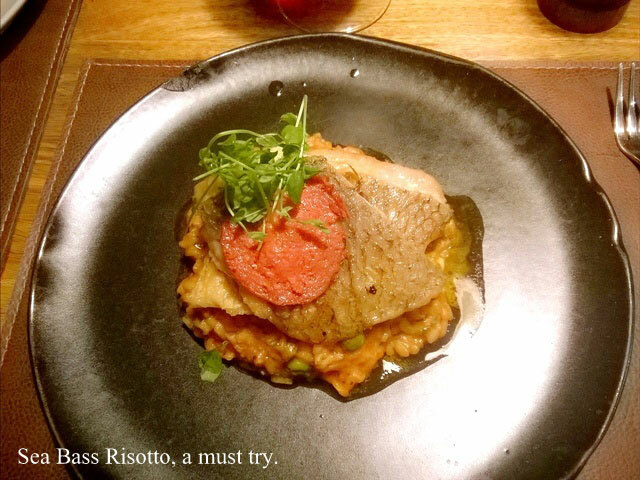 It was then that we forced ourselves downstairs to enjoy our mains, the Coffee Parika Tenderloin and Sea Bass Risotto in some peace. The dishes arrived looking beautiful in the way they were plated and then came the moment of truth. 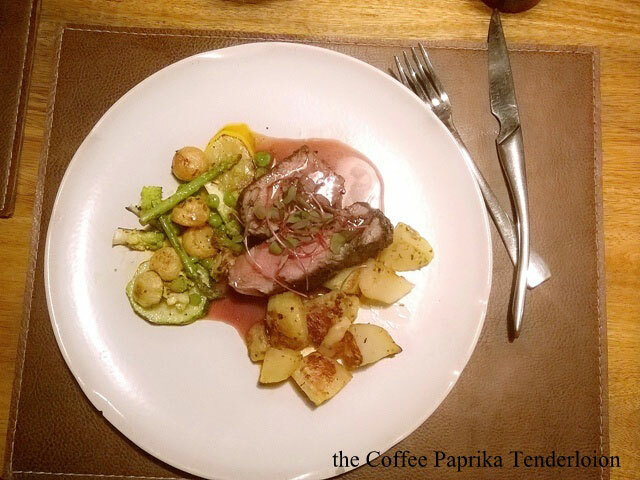 I had request my steak to be medium but what was served was rare, so despite the deliciously creative coffee paprika sauce I had to survive on the roasted potatoes and grilled vegetables that were served on the side and the steak had to be left to its own destiny. The Sea Bass risotto on the other hand was quite a thing. A beautiful golden, crispy skin over the perfectly cooked sea bass served over a spicy lobster bisque risotto was a delectable affair. That’s precisely the kind of food I’d expect from a fine dining restaurant. So since I had hardly eaten the steak I knew I could finish up a plate of dessert to myself. The menu seems to be under an overhaul so half the items under the dessert list of about 5 or 6 were not available and we went ahead by the recommendation of the waiter. 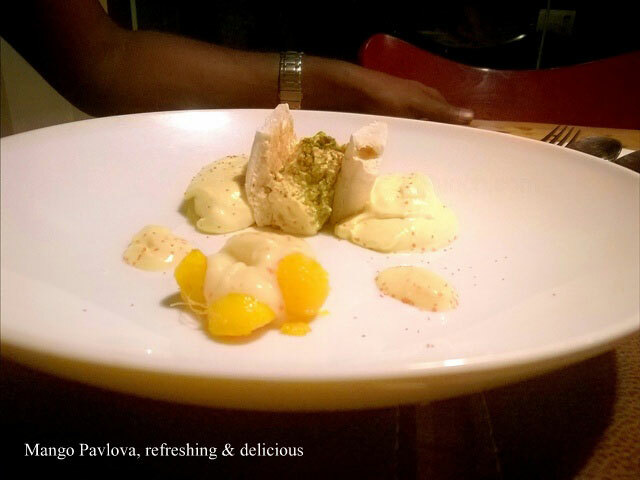 So what arrived was a Mango Pavlova along with some fresh Mangoes, a Mango Mousse with Pistachio. It was a delicious treat too, the crunch of the Pavlova and smooth texture of the Mousse and fresh mangoes combined in a perfectly refreshing harmony. So, it was like a roller coaster ride with its fair amount of highs and lows striking themselves off to manage just an ‘average’ for the overall experience. And frankly if I’ve to pay a bill amounting to Rs. 4579 (excluding RS 2325 extra for the drinks) for a meal for two I’d rather choose another from the plethora of fine dining restaurant in the city. Despite the entire buzz around it, I’d say it was not worth the effort, primarily owning to the absolutely terrible service. And yet, being one of the only African speciality restaurant in the city if you totally must visit, do try the Sea Bass risotto and the refreshing Mango Pavlova. 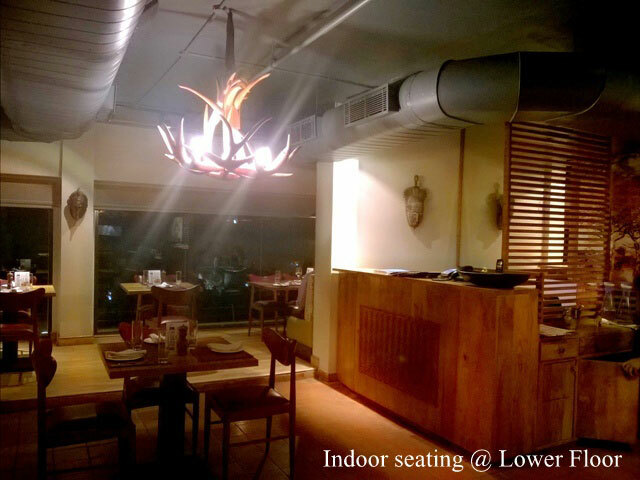 Review: Uzuri Deck and Dining, Delhi, the African- European themed restaurant that's been making a buzz, but is it worth the visit? Read on to find out. That restaurants is amazing restaurant. If you wanna drink different variety of cocktails then this restaurant is only for you.